Every design on this shopping for needlepoint necklaces page is created in easy to read chart form with full instructions for a pleasurable stitching experience. But remember ….CUSTOM SIZES AND COLOURS ARE AVAILABLE! Contact me for a quote. 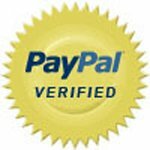 Please go to our Terms and Conditions page for more detail on the services we offer, Shipping Costs, and how to make secure payments with PayPal . Click here to view What's in Your Chart Kits! I hope you'll enjoy stitching your necklace as much as I've enjoyed creating it for you! Description: Five (5) original needlepoint collar necklaces chart patterns at 18 holes per inch (18 hpi); all necklaces are curved in shape at approximately 8” (20.32 cm) wide x 7” (17.78 cm) high. Choose patterns: Rose Feathers, Japanese Parasols, Spring Buds, Dorn Deco Colours or Dorn Deco Neutrals. NOTE: AVAILABLE IN CHART FORMAT ONLY. Necklace notions, (chains, etc.) not included. Specify Desired Pattern(s) in ‘Comments’ window below. 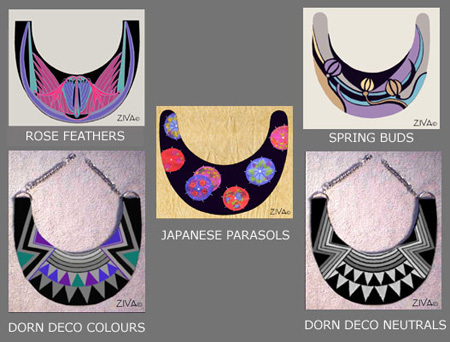 Learn more about these unique collar necklaces designs.